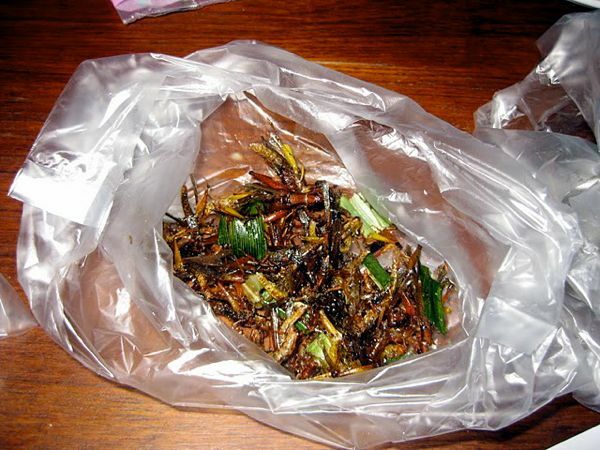 Andy Dickinson collected as many worms and crickets as he could in Bangkok. Then he ate them. 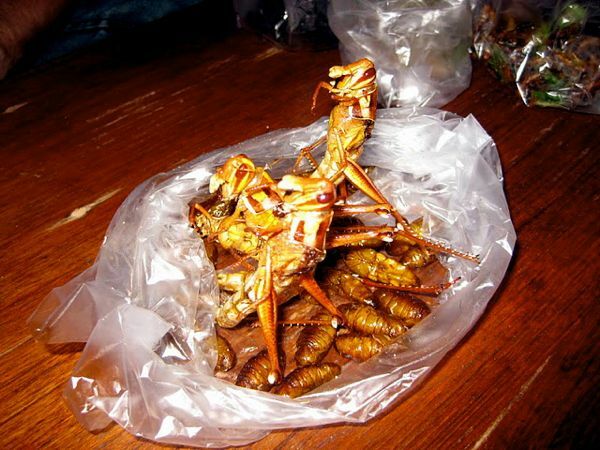 I decided to start my culinary experience on the most famous of bug street food, the grasshopper. Damn, these guys are huge! Not wanting to bite one in half, I decided to shove it all in my mouth at once. I failed, and its legs stuck out of my lips. Not a good look. The grasshopper’s upper torso and legs was extremely crunchy, while its body was quite soft. It was kind of like eating a whole prawn, minus any nice taste. Most notable for the contrasting texture of soft or crunchy body parts. Feeling: Dread. Comparative Insect Rating: 2/10. These guys looked like short, fat caterpillars and one easily fit into my mouth in one shot. Chewing caused it to break down into dust, coating the inside of my mouth. It was like like I’d just eaten a moth. A big swig of beer saved the day. Feeling: Resentful. Comparative Insect Rating: 3/10. Another grasshopper-like insect to eat. I popped one into my mouth and found it to be slightly crunchy, yet eating it was not anywhere near as unpleasant as the last two. I grabbed three more and ate them with the same not-so-bad result. It had only a little taste (which tasted like, well, a bug). These fellas had been fried and served with some sort of leaf, hopefully to give some sort of improvement in taste. Popping a few in my mouth, I found them crunchy, salty and entirely inoffensive. Maybe I was getting used to eating these sorta things? Tasting salty and a little insect-y, they washed down well with my more-than-handy beer. Feeling: Relaxed. Comparative Insect Rating: 8/10. These are not the little black ants that crawl on your feet and bite you for no reason, but larger ones with wings. 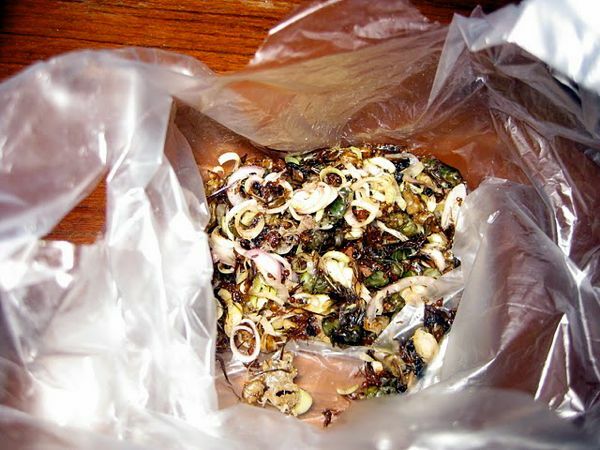 They’re served up in some sort of salad that’s overdosed with chopped lemongrass. A spoonful of the salad unsurprisingly tasted like a whole heap of lemongrass. What’s the point of an ant salad if it just tastes like lemongrass? I guess it’s better than making a salad that tastes of ants. Trying a few lone ants, they tasted like a whole lot of nothing. Feeling: Bored. Comparative Insect Rating: 5/10. 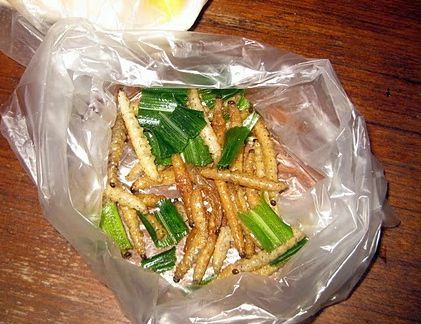 Bamboo worms were short and white, looking similar to a caterpillar missing a few legs. They had a soft shell, not too crunchy, and thankfully very little inside it. They collapsed in my mouth, leaving a pleasant savoury taste, which went well with beer. Side armed with a few cool Singha’s, I could easily have finished a small bag of these. Feeling: Cheerful. Comparative Insect Rating: 10/10. Urgh, crickets, just like the ones I used to squash when I was young. They were instantly unappealing to me. The pub soundtrack ticked over to “Help” by the Beatles, and I wonder if the DJ was secretly reading my mind. The cricket’s body flaked when chewed, spreading what I picture to be wings, legs and pieces of head through my mouth. I resorted to the beer solution. Feeling: Despondent. Comparative Insect Rating: 4/10. 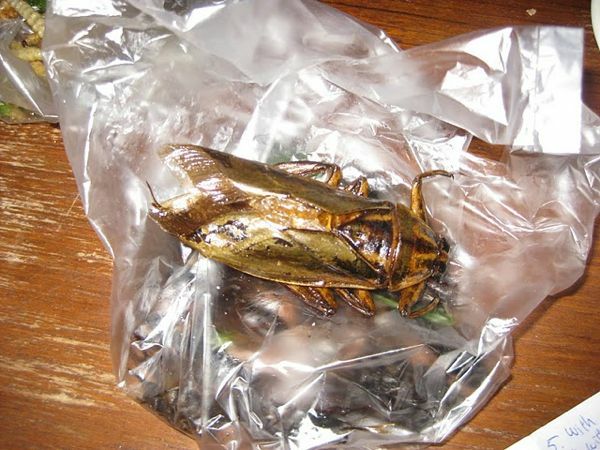 This water bug was indeed giant, quite possibly the biggest bug I’d seen in my life. I was advised not to eat the whole lot (it was big enough to make a cutlet) and instead took off the wings, tore open the body and ate the gooey insides. Wonderful. Opening the torso, I used my teeth to draw out what was inside, doing my best not to think about what I was about to ingest. 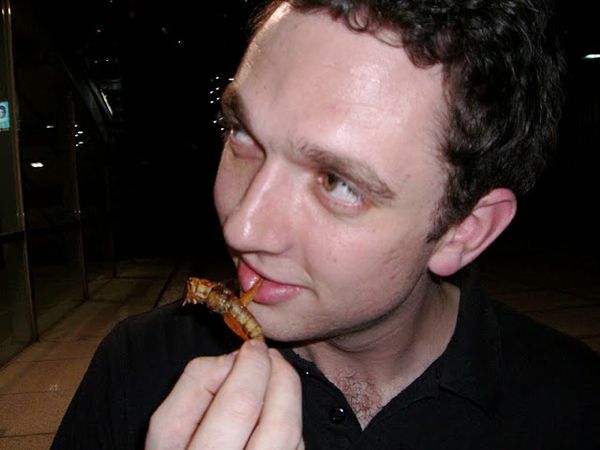 The experience of eating the insides of a 10cm insect was as horrible as it sounds. Funnily enough, the squidgy body contents had a taste that was not entirely foul. Feeling: Surprised. Comparative Insect Rating: 5/10. I left this one until last, in the hopes that somehow it would revive itself and walk off the table. 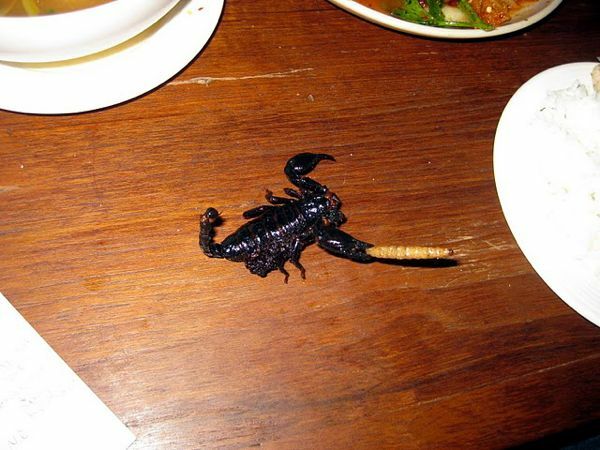 That way I wouldn’t have to eat it, and the pub staff could deal with a live scorpion while I watched what happened. I wished I’d done a little research on how on earth to eat these one of these things. I pulled off the sting and decided to eat the body. It is truly horrid. The outer skin was tough and there didn’t seem to be anything inside. Chewing it gave no immediate reward, then a horrid noxious taste filled my mouth and thoughts began to fill my head. Was I eating the part of the body that has venom inside? Would my travel insurance cover intentional ingestion of venom? I cursed myself for not reading past the second paragraph of my insurance fine print, then spit it out and threw the rest of the scorpion away. My tongue was black and this time beer wouldn’t remove the taste. Feeling: Relieved, but ready to spew. 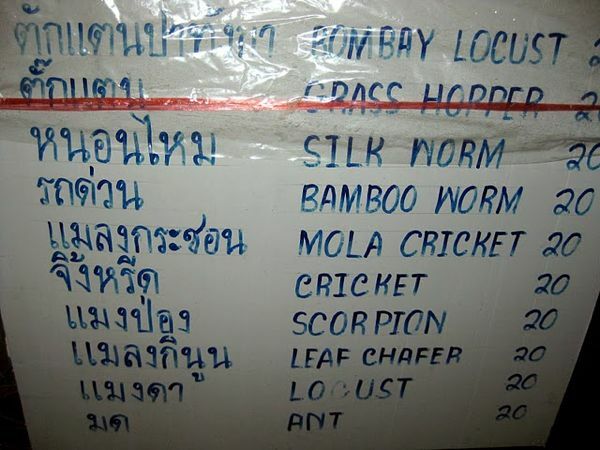 Comparative Insect Rating (and yes, I’m aware that a scorpion is an arachnid): 0/10.